Designing and producing bicycle accessories since 1932 in Germany, their slogan ‘Made in Germany’ is not just marketing hype, it reflects their high standards in quality, function & design. 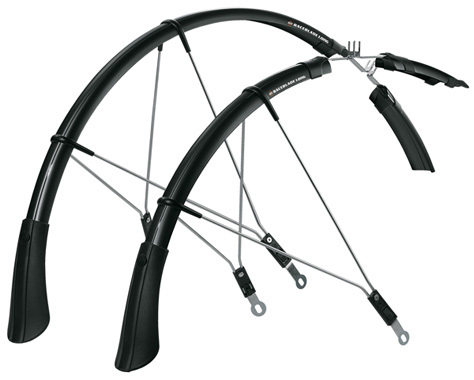 Mudguards might not be the sexiest cycle accessory but they help to keep you and your bike clean… SKS mudguards have been around for a long time and in our opinion they are the best ‘guards out there regardless of cost. 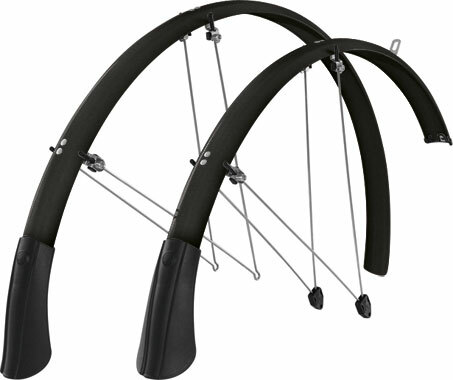 Designed to fit bikes with mudguard clearance (hybrids, ‘cross bikes, old school road bikes) these are a longer version of the SKS Chromoplastic with added rubber mud flaps front & rear to keep you as dry as possible… Available in Black (shown) or Silver and in 35 or 45mm widths. The extra long version of the popular Raceblade clip on guards these are the guards you need to fit onto close clearance road bikes to keep you rolling through the winter months. The longer extension to below the axle height means you’ll spare anyone following you from a ‘wheel spray shower’. Fitting is fairly straight forwards with 2 small metal brackets attaching around the brake calipers which remain in place if you remove the guards for drier conditions. Available in Black (shown) or Silver. 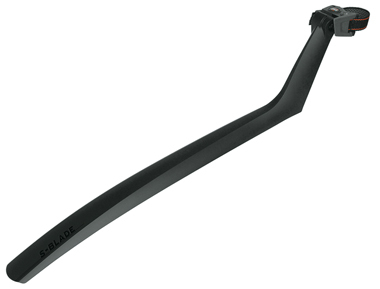 The S Blade clip on road guard is the skinny sibling of the top-selling Xtra Dry MTB clip on rear guard. The quick release mount allows the guard to be fitted quickly to almost any bikes seatpost.